1. 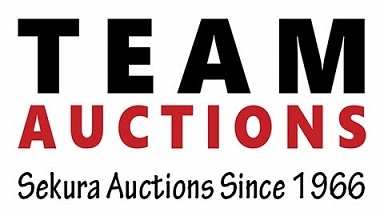 Team Auctions acts as a agent of seller and not as owner. 2. All items or livestock are to be paid for in full on sale day by cash or cheque acceptable to Team Auctions. GST will be added to bid price where applicable. 3. All items or livestock sell as is where is without warranty and are at the buyer's risk as soon as they are sold. Any warranty offered by a seller shall be a matter between the seller and the buyer and shall not involve the auction firm. 4. All buyers shall inspect each item or livestock and satisfy themselves as to the condition, fitness, soundness, and/or to the measurements of the items or livestock before bidding. 5. All items or livestock are to be removed from the sale location within the time announced by the auctioneer at the start of the sale. 6. The seller has made a Statutory Declaration before a Commissioner for Oaths declaring all charges, if any, against the goods sold. Team Auctions will pay out the declared charges and provide a copy of the declation to a buyer if required within two years. If for any reason clear title cannot given to any goods sold the liability, if any, of Team Auctions and/or the seller shall not exceed refund of the price paid at this auction in exchange for return of those goods in condition equal to or better than at sale time. 7. Terms of sale of real estate by auction shall be shown on "Offer to Purchase" posted prior to the sale. 8. The Auctioneer reserves the right to accept or reject any bid and in cases of dispute the auctioneer's decision shall be final. When an Auctioneer declares an item or livestock sold and more than one bidder claims to have the high bid the Auctioneer may declare who the high bidder is or re-open the bidding. 9. Team Auction, it's employees and the seller accept no responsibility for errors in advertising or description. 10. All buyers agree to be bound by the above terms as well as any other conditions announced by the auctioneer. In acccepting this registration card each buyer agrees to be responsibile for all charges to them and that if their cheque is accepted by Team Auctions it will be honored when presented for payment at the bankon which the cheque is drawn. If any cheque given to Team Auctions is not honored for any reason it is understood that the buyer issuing the cheque will face civil and/or crimianl charges.